Straight out of the vaults of the Do The Collapse sessions, Hope On Hope EP was essentially a purchase worthy springboard for the single of same name, plus a hefty portion of unused b-sides. Upon hearing this collection, it is fairly baffling as to why most of these songs did not make the final cut for the Do The Collapse LP, and instead, sat on the cutting room floor. Lo-fi fans who had lambasted that LP upon its release perhaps could not have cared less. However, the well of material on this EP is pretty astoundingly. Adding to the collector frenzy, in 2001 Pollard's Fading Captain Series label released Daredevil Stamp Collector, a vinyl only release. 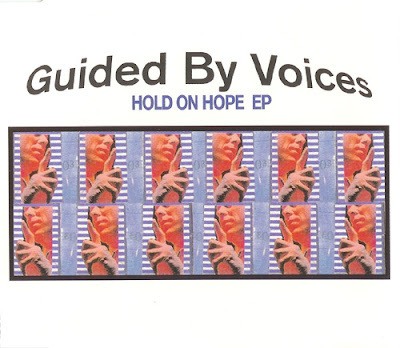 This limited to 1,000 release kept the same track order as the Hold On Hope EP from the previous year, but dropped the studio recorded title track and replaced it with the demo version. In addition, the inclusion of the track "Perfect This Time" was added. Underground Initiations- 5 Holy hell! Right off the bat this uptempo, pop rocker is a fantastic welcome track. Great lead guitar riffs, and of all things, a totally killer bridge. Interest Position- 3 Upbeat, and heavy rocker with some cool vocal hooks and some stabbing Gillard guitar riffs. It does border on being run-of-the-mill, though. Fly Into Ashes- 4 Swirling guitar jangle and pounding drums commence while Pollard delivers an airy, and completely gigantic, vocal melody over said pop-hammering. Tropical Robots- 4 Perfectly compact, little weird acoustic jam akin to early GBV EP tracks. Great little dual melody over pop-folk guitar strums and ridiculously enjoyable lyrics. A Crick Uphill- 5 One of the most un-GBV songs in the catalog is also one of their undeniably best. Half-time, southern folk rock, with marching snare rolls, and cries of “POUR SOME LIFE INTO ME JESUS!” Jesus? Since when has Pollard ever genuflected to the heavens? A great slow build-up to the big impossibly perfect finish. A true unsung classic buried in the cannon. Idiot Princess- 3 Grungy, guitar buzz trudges along at a steady pace. High pitched, distorted Pollard vocals call out, “over and out.” Over and out. Avalanche Aminos- 5 One of the coolest, repetitive sliding upward guitar riffs around. Angular pop-punk with killer melodies. This song has a knack for wedging itself in the most perfect part of your brain. Do the Collapse- 3 Instrumental song. Comparable to “Girl from the Sun” off Tonics and Twisted Chasers. Modest hard rock guitar song with a lean to the pop direction. Crunchy and direct. Hold on Hope- Same version as on Do the Collapse. Perfect This Time- 5 This song really is kind of perfect. Okay, it is pretty goddamn perfect. Too bad it's so hard to track down. Slowly paced and oddly soulful, it utilizes amazing layered harmonies to create a good old fashion pop-ballad melody. Great lead guitar riffs by Doug Gillard. Hold on Hope [Demo Version]- 4 The exclusive cut to the Daredevil Stamp Collector limited 12'', fans finally got a glimpse of the often lambasted, Pollard attempt at sap Top 40 balladry in the the late '90s. Here we get a bare bones, down stroke pounded, acoustic kitchen recording. The lyrics are still pretty crummy, but I've always stuck by the fact that the song, at its core, is pretty damn solid. should've been on Do The Collapse (the album). Agree to all these tracks being on the LP! Such a killer selection of songs! 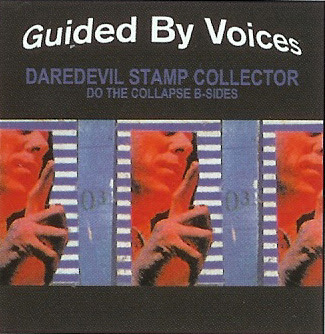 “Do the Collapse” could’ve easily been the first GBV double LP!